Taj Mahal standing proudly on the bank of the river Yamuna in Agra, is India's noble tribute to the grace of Indian womanhood. Built by Shahjehan, the 5th emperor of Mughal empire in the memory of his beloved wife Mumtaz Mahal, Taj Mahal is the largest and the most expensive mausoleum built by any man on earth. The "symbol of eternal love", Taj at Agra is undoubtedly one of the most spectacular marvel of the world. Renowned for its architectural magnificence and aesthetic beauty, it considered among man's proudest creations and is constantly included in the list of the world's topmost wonders. As a tomb, it has no equivalent upon earth, for mortal remains have never been housed so opulently. The Taj, huge itself, is not an isolated building but it is a part of a massive complex containing a main gateway, an elaborately laid garden, a mosque and a prayer house, outer enclosures and enclosing walls. Construction of the Taj Mahal began in 1631 and was completed in 22 years. Twenty thousand people were commissioned to work on it. The materials were brought in from all over India and central Asia and it took a fleet of 1000 elephants to transport it to the site. The dome is made of pure white marble, but the tomb is set against the plain across the river and it is this background that formulates the magic of colours that, through their reflection, change the view of the Taj at different time of the day. The hue change at different hours of the day and during different seasons. Taj Mahal is best viewed in a moonlight night. Like a jewel, the Taj sparkles in moonlight when the semi-precious stones studded into the white marble on the main mausoleum receives the glow of the moon. The Taj is pinkish in the morning, milky white in the evening and golden when the moon shines. Just a awesome spectacle to view. Visiting Hours : Open from sunrise to 19 hours. The monument is closed on Mondays. Tourists : 20 Rs. Free entry on Fridays. 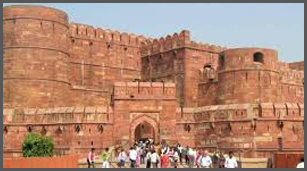 Built by three great Mughal emperors, Agra Fort is a massive structure housing several must see attractions. This was built by Noorjehan in the memory of her father Mirza Ghiyas Beg. This a beautiful structure with amazing carvings and inlay work. Situated at a distance of 10 km from Agra, This tomb of Akbar is a perfect blend of Hindu, Christian, Islamic, Buddhist, Jain motifs. 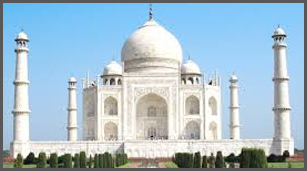 Air : Taj Mahal is located at Agra, which is easily accessible from all the parts of India by air. Rail : One can easily reach Agra by rail routes. Road : Agra has well connected road networks, which are linked to all the major destinations of Uttar Pradesh and nearby state. Accommodation is certainly not a problem here. We provide the best of the accommodation facilities just suited for you. The accommodation here ranges from luxury, deluxe to budget type. You can pick the one which best suites your interest and budget.